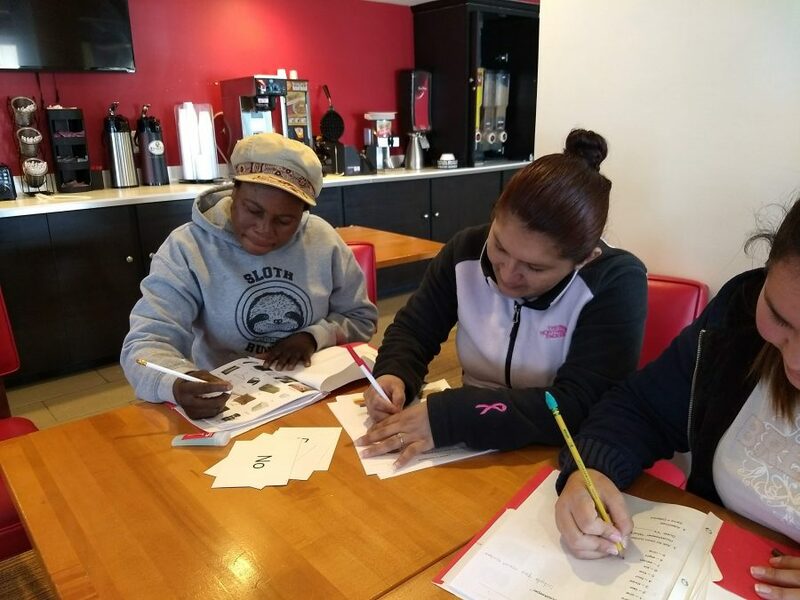 In January we expanded our customized workplace classes to include hotel housekeeping staff at the Econo Lodge Frederick. The workplace literacy team met with General Manager, Rupali Luthra, to determine areas of focus for the housekeepers. Together they developed several objectives, and ESL Instructor Victoria Dos Santos developed a custom 10-week curriculum. The students are learning through role-playing, taking the parts of both housekeeper and hotel customer. Match games and bingo (M&Ms are great bingo tiles) make learning and reinforcing new vocabulary fun! They also practice listening and pronunciation skills. At a mid-point meeting, Ms. Luthra observed that she has seen improved teamwork among the housekeepers, as well as increased confidence in speaking English among themselves. While they are still shy about speaking and interacting with customers, it is hoped that by the end of class they will begin to transfer their new confidence to conversation with customers. A spring class is in the works and we look forward to building on the students’ new skills!